The outer portion of the ear is formed by the pinna, which is connected directly to the eardrum via the ear canal. 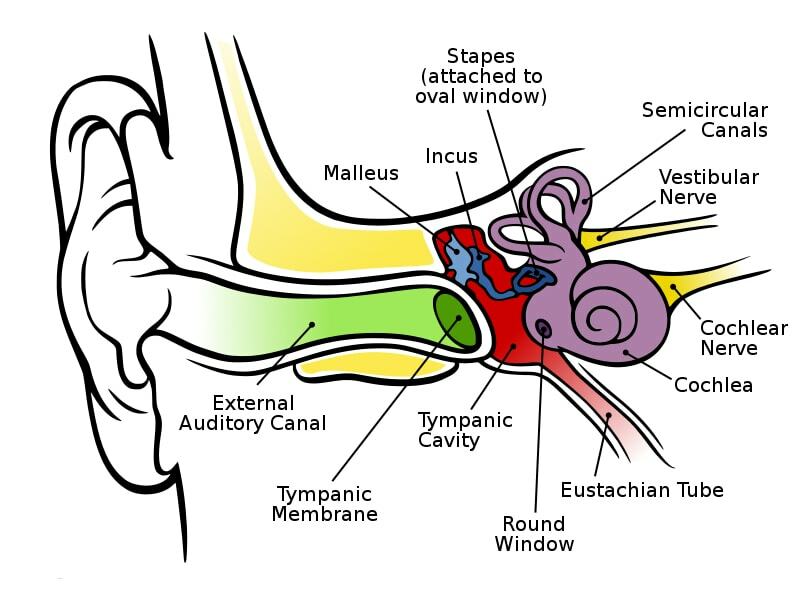 The ear drum in turn is connected to the ossicular chain, which consists of three small bones: the malleus, incus and stapes. All of these hearing “aids” are located in the middle ear, in which the stapes footplate is connected to the oval window of the cochlea, where signals are then transmitted to the auditory nerve. For hearing to be possible, it is important for sound to be modified by passing from the medium of air into the inner ear fluid within the cochlea. Since fluids are far denser than air, without this active adjustment within the ear, we would perceive all noise to be significantly quieter. Sound enters via the outer ear and travels down into the ear canal, before reaching the ear drum. Here, vibrations are then directly passed on to the malleus bone. A chain reaction follows, with the malleus sending the signal to the incus, where it is then passed on to the stapes and the stapes footplate. Since the acoustic signal gradually travels from the relatively large surface area of the eardrum to the very small stapes footplate, the signal is amplified step by step. Next, the inner ear fluid is made to vibrate. There are lots of little hair cells which act as sensory receptors within the cochlea with two important functions: they strengthen the sound wave even further and are also responsible for our ability to differentiate between different frequencies. It is this set of events that enables us to understand speech and distinguish various letters or words. Information exchange Loudspeaker announcements on a station platform -> Sometimes not all information from the announcements can be understood. -> When speaking on the phone or with other people, information can be misunderstood. Warnings/alarm function Car horn, alarm clock, fire alarm, crying baby -> Approaching dangers cannot be perceived. Emotional perception Laughing, crying, sarcasm, jokes, tone of voice, volume, music -> Sarcasm or jokes cannot be interpreted correctly. -> Children laughing or music cannot be perceived properly anymore. Spatial orientation Perceiving distances and directions with hearing -> Locating noises/signals in rooms is only possible to a limited extent. Social functions Creating and maintaining social contacts (private and professional) -> Social contacts such as friends and family are avoided. -> At work, there is a tendency to avoid the canteen, meetings and colleagues. Would you like to find out more about noise and hearing protection? Earmuffs vs. Earplugs | How do I find the right hearing protection? I want to make sure that my hearing lasts me a long time. I didn’t know that there were ways to help conserve hearing. That’s definitely something that I should want to consider for me.